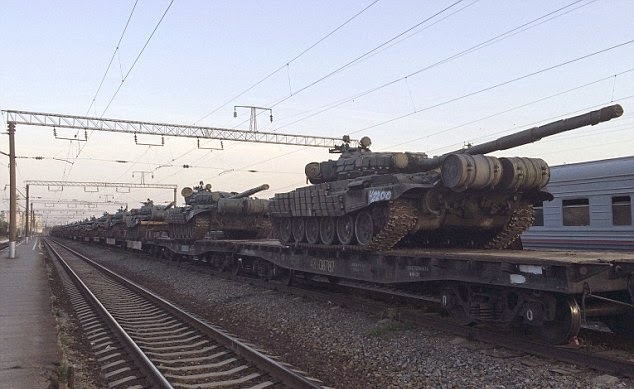 MATVEEV KURGAN, Russia -- A freight train pictured carrying a convoy tanks towards the Ukrainian border looks to escalate tensions between the two sides even further. Spotted: This mobile phone picture shows the Russian tanks on a freight train shortly after they arrived. The tanks arrived in the southern town of Matveev Kurgan on Monday, before being driven along the streets on Tuesday. The picture, taken on a mobile phone, comes just days after a huge convoy, including rocket launchers, military trucks without licence plates and armoured personnel carriers, was photographed driving along a road near the town. The arrival of the convoys will no doubt be seen as more aggression from the Russians towards their neighbours, who have been arming Ukraine's separatist rebels for months. Matveev Kurgan is just 17 miles from the border, and just 72 miles from Donetsk, where some of the heaviest fighting of the 15-month conflict has taken place. It holds a checkpoint between the two countries, but had to be evacuated temporarily in August last year when fighting got too near to the border, according to Russian news agency TASS. Elsewhere in Russia, it seems Putin is just as keen to show off his military might. A massive 'surprise' military drill featuring 12,000 soldiers and 250 aircraft was launched in response to two weeks of NATO exercises in the Arctic. The Russian manoeuvres - which began in the Ural mountains and western Siberia yesterday - are intended to help the military prepare for an even larger drill in September, called Tsentr-2015. This week's drills began on the same day as NATO launched its own long-planned military exercises in the Arctic, where 100 aircraft and 4,000 servicemen from Germany, Britain, France, Netherlands and the U.S., are taking part in a Norway-led aviation exercise described as the 'largest of its kind'. Non-NATO allies Finland, Sweden and Switzerland have also joined the so-called 'Arctic Challenge'.